Part of following Jesus is learning to love the people you wouldn't normally like. I was thinking about it the other day and I realized that the ability to love really comes with a deep spiritual maturity. You have to internalize, claim, and own Jesus' mission--that is the Jesus for whom love meant death on a cross--for yourself before love really becomes what love should be; something done out of selflessness, something done solely for the other, independent from the outcomes experienced by the lover. Our love has little do do with the object of our love. It does not matter if the object of our love is a hindrance to us, a bother to us, or even violent to us. It doesn't matter if they're stinky or weird or if our relationship with them will discomfort us or make us the object of scorn or mistreatment. Love is messy and no one in their right mind would aspire to be truly loving unless they understood their love as, in some way, a way of participating in that which the God of the universe is being and doing in the world. Unless we love as a response to love given to us... the same kind of messy love... and unless we understand our own undesirability, then we will always seek some benefit for ourselves, we will always see ourselves as charitable and good for loving another, we will always set some criteria for determining who and who not to love, and will not see why on earth it would be worth it to actually love at all. Although love is so messy and so inconvenient, we still glamorize it in the wrong way. Don't get me wrong... love is wonderful and glorious and deserves to be glamorized. But the light in which we glamorize love reflects back to us a false image of what love really is. We speak of loving the poor, caring for those in need, and sharing with the oppressed as though it's pure joy without hardship. I think we imagine ourselves sitting with a homeless man, eating a meal and sharing funny stories (which might happen when we love the poor) but we neglect to imagine that same homeless man cussing us out, taking advantage of us, refusing to do that which we believe he should in order to better his situation. We imagine helping the single mother with her groceries and receiving a warm smile and a good feeling but we don't imagine that same single mother beating her children and screaming at you that she hates you. I've told stories to the kids in our church about the people I know who are in need of help. When I speak about their need, the students get excited and want to help (and I am so proud of them for that!). They want to invite them to church, they want to visit them and help them. But in my mind I think, "you don't know these people, you wouldn't like them if you did." I see the other side and I know how difficult it can be to love these people. I know that if we went where love would take us, we would find ourselves in very difficult places. Now, maturity--the kind which sustains and lasts through the difficult side of love--is the ability to see love as kind of death and to smile still, knowing that resurrection is on the other side. Maturity is seeing that love does not always feel good but it always wins (even if winning looks like failure for three days). Spiritual maturity is knowing that love might strike you down but it will also lift you up. When a student is willing to welcome someone to church who they normally would want to avoid, when they're willing to love someone who has wronged them, when they're willing to go to those whom they'd avoid if it were not for love, I am encouraged. This is a sign of real maturity. 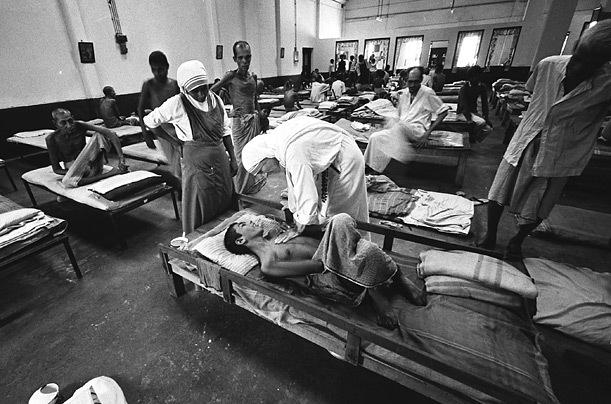 I am captivated by the example of mother Teresa. Surely she knew the darkness of love but for her the darkness could not overcome the light. Mother Teresa loved people whose situation could not improve. Her love constantly fell apart in her hands as the object of her love died. But her maturity was in the fact that even when the ones she loved died in her arms, the object of her love lived on, because for Mamma T, Christ was always the object of love. When we can love the least of these and truly understand that we are loving Christ, then our love will live through the pain of death because the one we love lives!